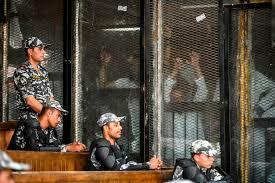 Egypt court sentences seventy-five protesters to death – Royal Times of Nigeria. An Egyptian court has sentenced 75 people to death for participating in a 2013 protest against the overthrow of the country’s democratically elected president Mohammed Morsi. Senior members of the outlawed Muslim Brotherhood organisation were among those ordered executed by the Cairo Criminal Court today for their involvement with the sit-in demonstration at Rabaa Square in the Egyptian capital, Cairo. The rulings will be referred to Egypt’s chief Islamic legal authority, the Grand Mufti, for a non-binding opinion. Egyptian law requires any capital sentence to be referred to the Grand Mufti before any execution can take place. The Mufti’s decision is rarely ignored by the courts. In 2014, the Mufti rejected a death sentence proposed for the leader of the Muslim Brotherhood, Mohamed Badie, who is part of the same case. Badie has since been sentenced to life in prison. A final verdict is expected by the eighth of September.